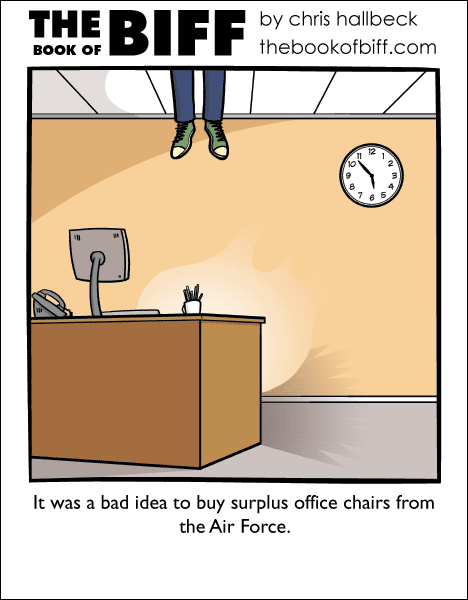 It’s a good thing that office chairs don’t normally have an ejection button. There have been many occasions that I would have used it. Or hit the button on someone else’s chair. That’s when the whole “working on the 6th floor of a 20 story building” thing really gets in the way. It seems Biff didn’t know ALL of the functions on his chair. Judging from the clock I’d say he’s been there for a while. Today’s Biff? I never realised his shoes were green until about a year ago, this just accentuated that. If you guessed 16, you’re wrong – you don’t need a staircase to get to the first floor. Well, that’s one way to get sick time. Yanno, the first ejection seats didn’t use rockets. They used cut-off five-inch naval shell casings. Looks like Biff got a hold of a *really* surplus chair! Well, this is funny. I always wanted to escape working as an intern, especially if I couldn’t use the high-speed stapler. @BrainpanSonata; Owns..?! Biff probably INVENTED those!